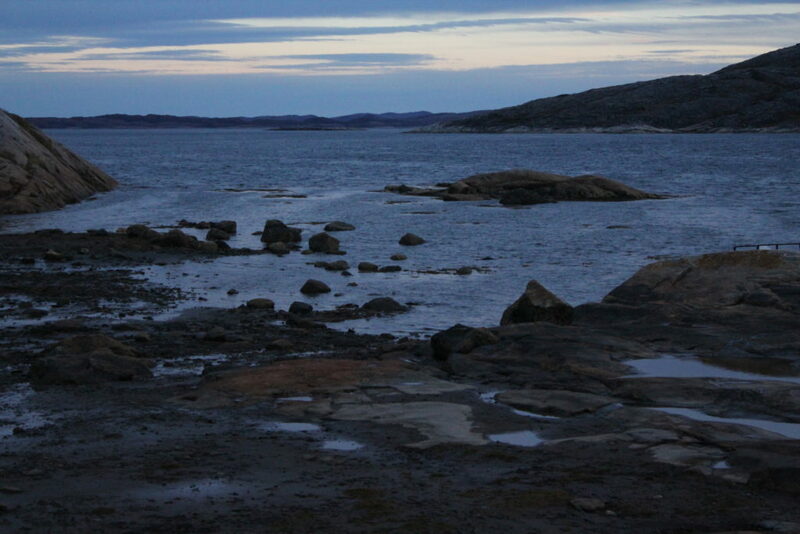 After what appeared to be a week of crossing the Labrador Sea, the Fram finally reached Hopedale. After that crossing, I considered myself to be competent to survive the Drake Passage crossing in Antarctica. As is the case with adventure cruising, ports of call are always subject to change as is the time of arrival. The Expedition Team announced that this would be a challenging landing. The striated stone that slid into the water was beautiful, yet treacherous, as it was not only slick, but also had swirling patterns that could easily cause vertigo. Several residents strolled the streets and we were made aware that some of the locals were selling handicrafts in the community building. In Inuktitut, the original name of this town was Arvertok meaning “place of the whales.” Unfortunately, no whales were sighted while we were in port. Moravian missionaries from Germany arrived here in 1782 and established a community called Hopedale. Some of the wooden buildings in Hopedale are amongst the oldest in eastern Canada. 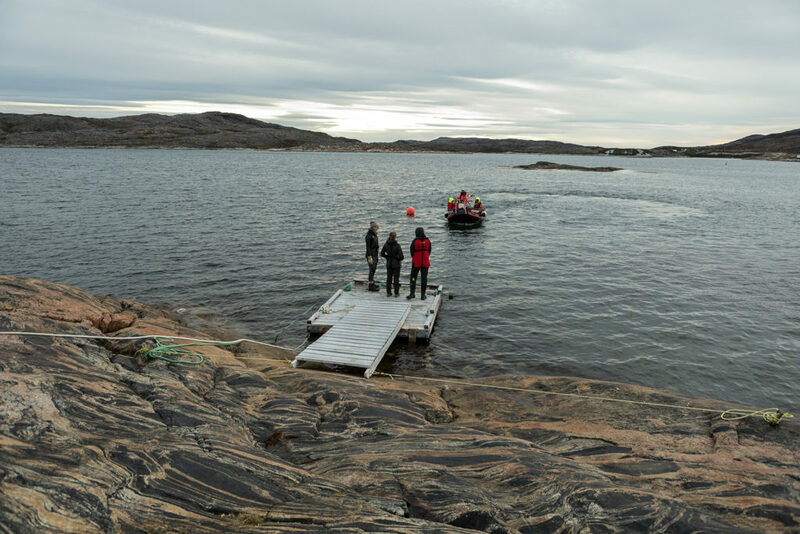 The small town is accessible by ferry; no roads connect this desolate outpost to any other town in Labrador and Newfoundland. Although our arrival was near dark, several villagers came out for the specific task of welcoming us. One man showed me the local stone, labradorite, and gave me a chunk as a souvenir. This alleged stone of magic and curiosity looked nothing at all like any photos that I had seen. Nevertheless, I gratefully accepted this small welcome gift. With light shining through their windows, the buildings of the mission complex gave off a Christmas village glow. 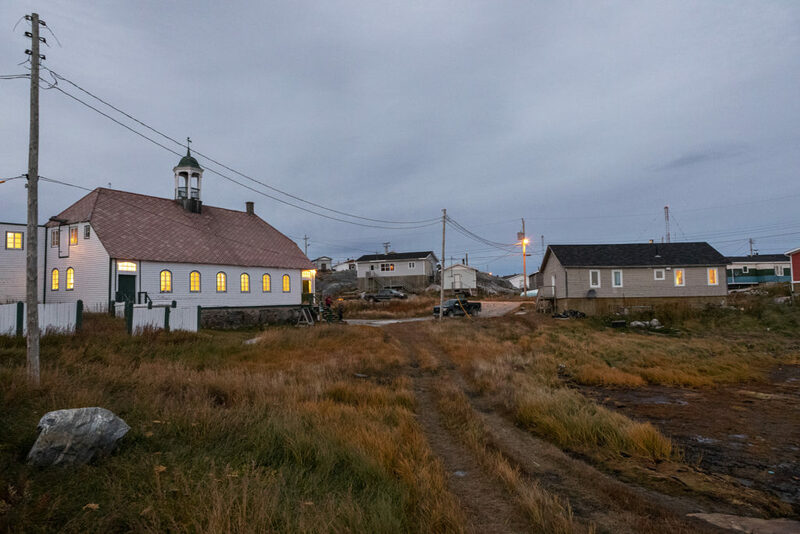 The church functioned as a museum with displays illustrating the history and artifacts from this time of displacement of the Inuits. I finally found the craft display, which featured just a few offerings. I was offered a carved polar bear for a mere $500. I declined. With just a few hours in Hopedale, I quickly walked along a few of the town streets in search of an old cemetery. A local showed me to the overgrown field that had a small wooden plaque indicating that the spot was a burial ground. With so little light and no easy way to explore, I turned around and headed back to the tender after gingerly negotiating the slippery rocks to the makeshift dock. The tender boat experience always varied. Some drivers were excellent and made sure not to splash water onto the passengers or go so fast as to create a windchill. On this trip back to the mother ship, the driver made quick turns and waves of water splashed the passengers. The chill air combined with the drenching made the trip quite unpleasant.